Bridgestone has been a long-time supporter of karting with quality racing tires. We list the YLP (rain) tires here on this page, but we also have YLM's and other models of Bridgestone tires in stock. Bridgestone has dominated kart racing around the globe, for over 40 years. Bridgestone consistently produces the highest quality and top performing kart tires in a wide range of compounds and sizes. Bridgestone YLP - Kart tires for wet conditions. ROK Cup USA approved! The best full rain tire for wet conditions. The YLP measures 44 durometer and is listed as category CIK 13 Wet. Sizes available are 4.5/10.0-5, and 6.0/11.0-5. Great tire for rain races, this tire will out perform most any other brand on a full wet track. Tire pressure recommendation ranges from 15 to 25 psi depending on conditions, kart, and driver ability. Aluminum rims will generally retain heat better than magnesium rims and their flex is recommended for wet applications. **Note: sale pricing is good only on tires in stock - they are not ROK labeled tires. 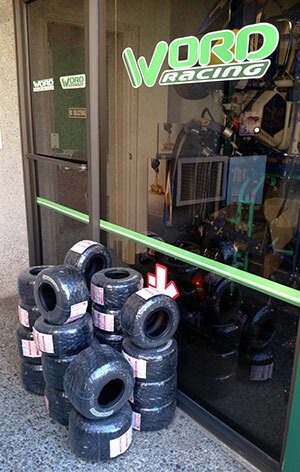 We do carry ROK labeled tires, but they sell at retail price. Contact us for details. IMPORTANT: See safety information below. 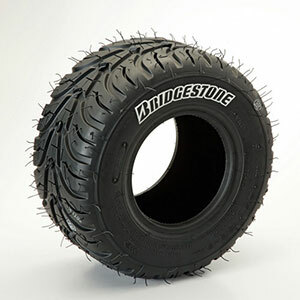 All Bridgestone and Firestone Race Kart tires are tubeless. Extra care must be taken to prevent leakage from both the tire and wheel. Always check for damage to the tire bead, O-ring (two-piece wheels) or wheel rim. Use special attention when mounting tires on cast one-piece wheels as any damage to the wheel may lead to a catastrophic failure when mounting. It is recommended that the tubeless valve ‘TR412’ be used in all race kart applications. Kart tires may crack in the tread area from impact or deformation at low ambient temepratures. Handle and store kart tires with care. Do not store in temperatures below 32 degrees F.
Rear « When mounting on the rear axle, the tire should rotate in the same direction as the arrow. Front » When mounting on the front axle, the tire should rotate in the same direction as the arrow. Disclaimer - Motorsports are potentially dangerous, please read the disclaimer, and wear proper safety gear. Payment of Freight Charges for International Shipments - Enter name (or sales order #) in the box below, click the Buy Now button, and enter the amount quoted (contact us for quote). Note, this will be a separate transaction, it will not add to cart. Customer is responsible for any Customs charges or taxes their country may charge.